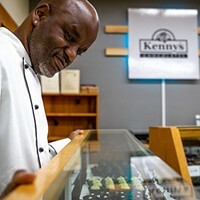 Jonah Ginsberg in the Humboldt Chocolate Bites kitchen. The idea of chocolate edibles isn't new but in an area that's marketed itself as the cannabis capital of California, making a point to stay local is significant — especially for a region where farmers feel stifled by shifting regulations and the challenging financial cost of coming into and maintaining legal compliance. That's one main reason Jonah Ginsburg, president of Humboldt Chocolate, and Isaiah O'Donnell, COO of Emerald Family Farms, decided to collaborate and create three new types of edibles called Humboldt Chocolate Bites. Beyond the business patnership, the two have been friends for five years. "We spoke years ago about a possible collaboration but weren't in a good place for it, says Ginsburg, who owned the non-cannabis Humboldt Chocolate retail shop in Snug Alley before selling it last year. "It was important that, if we were going to do this, that we kept it local," Ginsburg says, noting that staying with local cannabis products was essential in the process. "I couldn't do it any other way and wouldn't want to. I'm excited and happy about this new collaboration." Emerald Family Farms supports close to 200 different cannabis farms and operations with cultivation and distribution. That help, according to O'Donnell, yields benefits beyond product sales. 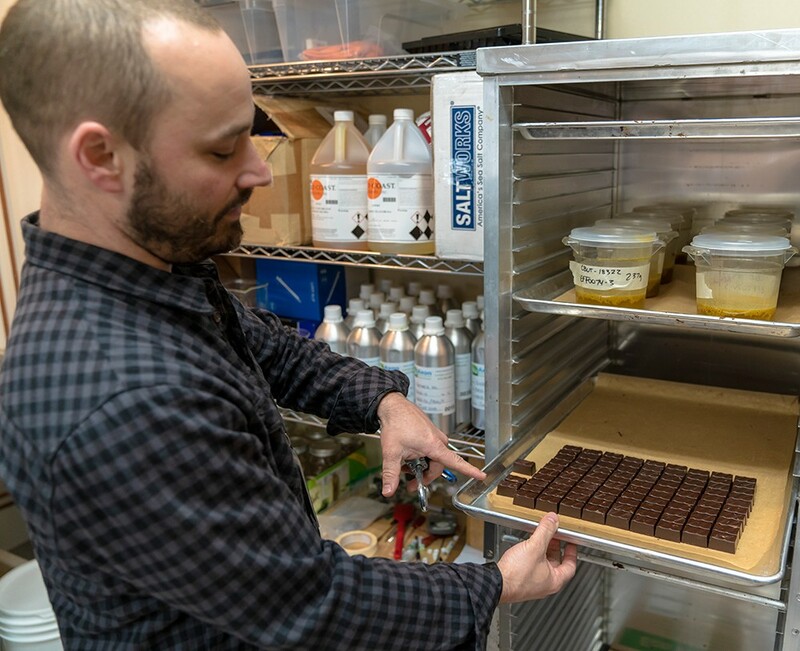 With the chocolate edible collaboration, he hopes to help others struggling through the relatviely new legal marijuana market. "With this we help spread the wealth and [help others to] be successful. It was a natural fit. ... We can't be successful without collaboration," O'Donnell says. 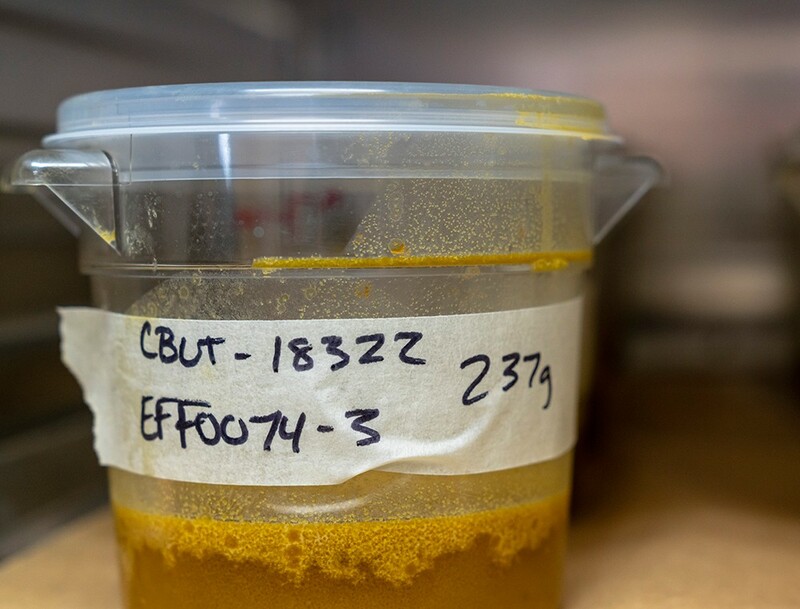 Creating commercial edibles also requires adhering to more regulations than basic chocolate kitchens, which are complicated enough to begin with. The two had to use a Type 6 manufacturing commercial kitchen, which, according to the California Department of Public Health's Manufactured Cannabis Public Safety Branch, means that the kitchen is approved for extraction using a mechanical method for non-volatile solvents — that includes CO2, ethanol, water, food-grade dry ice, cooking oils or butter. It also has to be completely separated from non-cannabis food production. Not quite the same as whipping up a tray of dank brownies with canna-butter at home. "In the past, less regulation in edibles made them unpredictable," O'Donnell says, echoing a common complaint. "The amount of dosage in the product was not consistent and there was no testing or oversight. Now we have more of a system." That system yielded three new Humboldt Chocolate Bites varieties: Sativa Bites, Citrus Bites and Mindica Bites. Each has a unique flavor and dosage. The Sativa Bites are described as "dark chocolate combined with coarse sea salt and 10 milligrams of THC from a Humboldt grown Sativa dominant cannabis strain." Citrus Bites are "a smooth, creamy dark chocolate with a twist of Mandarin orange and 10 milligrams of THC from a Humboldt grown Indica/Sativa hybrid strain." Lastly, Mindica Bites are "a smooth, deliciously creamy dark mint chocolate combined with 10 milligrams of THC from an Indica dominant Humboldt grown strain." The chocolates are also vegan and made with only non-GMO ingredients. Ginsburg says he's been refining the cannabis recipes for the last three years. "I have experimented with various chocolate, flavors and extracts in order to develop a product that I am happy with," he says. Along with taste, consistency and predictability were crucial goals for Humboldt Chocolate Bites. "We wanted to make sure we had a homogenous product. So someone can eat half of it and get half of the dosage. We believe it should be evenly distributed," says Ginsburg. Both Ginsberg and O'Donell point out that the effects of edibles can be more or less intense depending on the consumer and their tolerance levels. "In the end, the consumer can find out for themselves when it comes to how much they should eat. Edibles start really slow. It's important for them to gauge a healthy amount," O'Donnell says. 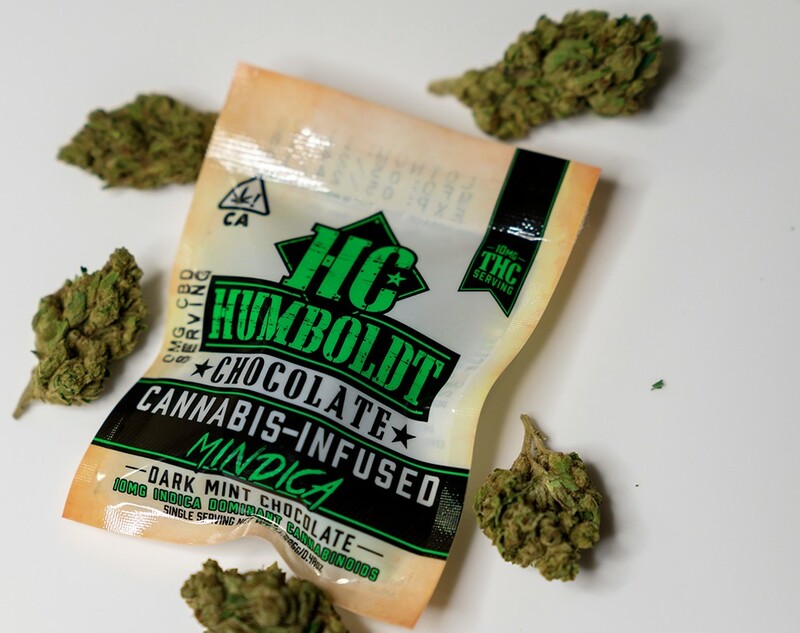 Humboldt Chocolate plans to expand the edibles into larger chocolate bars but, for now, both Ginsburg and O'Donnell are sharing the highs of collaboration, friendship and bits of cannabis-infused treats.